Llega el siguiente hito de esta nueva era dorada de los juegos de rol japoneses con LOST SPHEAR, que le da un nuevo giro a la jugabilidad de rol clásica. Un joven que ha padecido un fenómeno nunca visto se enfrenta a una terrible fuerza que pone en peligro la realidad. ¡Despierta el poder de los recuerdos para recuperar lo que se ha perdido! Haz acopio de distintos recuerdos y transforma todo lo que te rodea en una aventura para salvar el mundo. Dos pistas musicales compuestas por Tomoki Miyoshi: "Market Town Marpennig" e "Imperial Capital Watt", esta última exclusiva para Steam. ¡Un fondo de pantalla especial! Tamaños para descargar: 1024 x 768, 1280 x 1024, 1920 x 1080 y 2560 x 1600. Una historia única e inolvidable con una jugabilidad fluida. Un sistema de batalla mejorado con BTC 2.0, que ofrece más libertad en combate. Equipo mecánico: Captura robots Vulcosuit por el mundo o durante las batallas y luego equipa a tus personajes con ellos para conseguir habilidades mejores. From the creators of I Am Setsuna comes another JRPG that aims to recapture the genre’s golden years. Anyone who loved PlayStation-era RPGs will immediately fall in love with the dreamlike, pastel landscapes of Lost Sphear. You are a citizen of a peaceful village surrounded by an untamed wilderness filled with monsters. One day you wake up to find your best friend has gone missing, and it is unlikely that they have just gone for a stroll in the woods. You see, in this world, everything is imbued with the power of memories. If those memories disappear, so does the object, or perhaps even the person. But if that is the case, how can your friends vanish when they’re right there on your mind? It’s an interesting setup that could be the basis of some powerful storytelling filled with themes of family, friendship, and what happens to our legacies when people cease to remember us. If you played I Am Setsuna, Lost Sphear will be instantly familiar, from its turn-based battles to its somber tone. However, rather than the desolate snowscapes of the studio’s last game, this is a lush land filled with greenery. 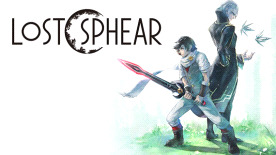 As well as the obvious visual differences, Lost Sphear takes place in a different kind of fantasy to I Am Setsuna, taking us to a world filled with advanced machines that can be captured, imbuing your characters with special abilities when equipped.